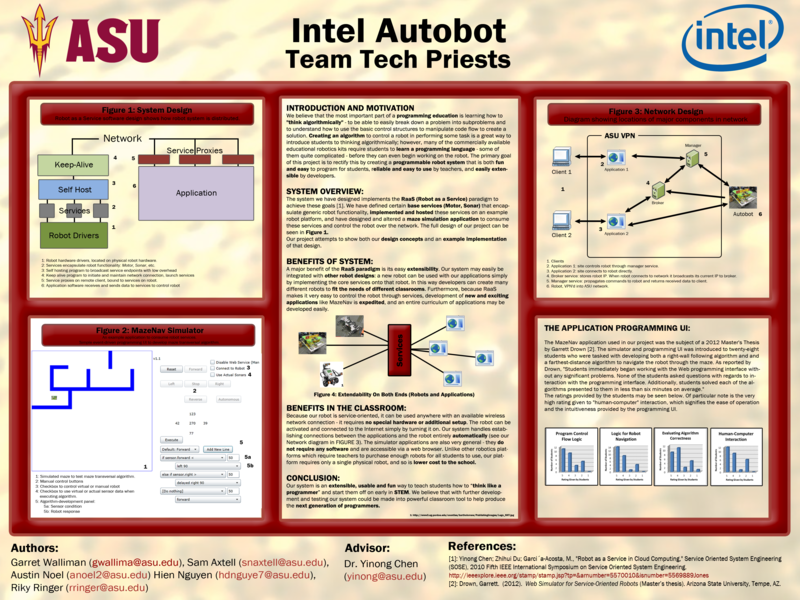 The Intel Autobot Project was my Senior Capstone project at Arizona State University. The purpose of the project was to connect a robotic platform (the titular "Intel Autobot", developed jointly by ASU and Carl Hayden High School) to a educational programming GUI / simulation web application (called "MazeNav", developed by Garrett Drown) through the use of self-hosted WCF services. 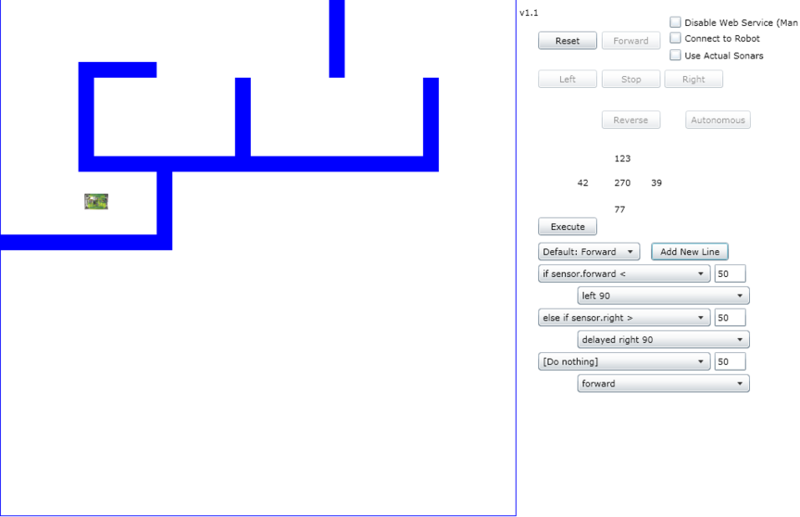 The MazeNav application could then to be used to develop a basic maze-solving algorithm, which could then either be simulated within MazeNav (using a simulated maze and simulated sensor data), or run on the actual Intel Autobot (using a real maze with real sensor data). This project serves as the intellectual prototype to a new method of early programming education. The MazeNav simulator (an older version of which may be viewed here) serves as a concept-based programming tool, in contrast to more modern syntax-based programming tools. Programming in MazeNav focuses on the concepts of the various items, providing a more fundamental introduction to computer programming, which I believe is a superior approach to current methods. Connecting the Intel Autobot to MazeNav allows students to view how their programs work in "real life", conceptually reinforcing what they have learned, as well as attracting more interest. The use of WCF services allows the programming tool to be extremely versitile in where it is used, requiring only an internet connection. The Intel Autobot project was selected as a finalist in the 2013 Intel Cornell Cup under the team name "Techpriests". Click here to learn about the MazeNav software. Click here to learn more about the Intel Autobot robotic platform.